Cognac in African-American culture: The long history of black consumption of the French spirit. The decades-long love affair between French cognac producers and African-American consumers. Americans had been drinking cognac for almost two centuries before it started showing up in rap lyrics. However, cognac’s réputation française belies a split personality. The French don’t touch cognac. Instead, they export more than 97 percent of it, according to the tourist board of Poitou-Charentes, the administrative region where Cognac is located. The U.S. is the biggest single customer, with African-Americans accounting for a large majority of those sales. The story of cognac’s rise in the U.S. is familiar to aficionados: During the 1990s, cognac sales were slow, and the industry was battling an image populated by fusty geriatrics. Then references to cognac began surfacing in rap lyrics, a phenomenon that peaked in 2001 with Busta Rhymes and P. Diddy’s hit “Pass the Courvoisier,” causing sales of the brand to jump 30 percent. During the next five years, other rappers teamed up with brands, and increased overall sales of cognac in the U.S. by a similar percentage, according to the Distilled Spirits Council of the United States. But don’t call it a comeback. Americans had been drinking cognac for almost two centuries before it started showing up in rap lyrics. Old export records from both the Chateau de Cognac and Martell show deliveries of cognac to the U.S. during the 19th century, where its refined smoothness was a favorite drink of the upper class and a welcome refuge from the noxious, unaged spirits gushing out of the frontier. American distilling manuals from the early 19th century recommended ways Americans could mimic cognac, a spirit they considered the peak of the distiller’s art. Cognac’s relationship with African-American consumers started later, when black soldiers stationed in southwest France were introduced to it during both world wars. The connection between cognac producers and black consumers was likely bolstered by the arrival of black artists and musicians like Josephine Baker, who filled Paris clubs with jazz and blues during the interwar years, according to Dr. Emory Tolbert, a history professor at Howard University. France appreciated these distinctive art forms before the U.S. did, continuing a French tradition dating back to Alexis de Tocqueville of understanding aspects of American culture better than Americans did. For African-Americans, the elegant cognac of a country that celebrated their culture instead of marginalizing it must have tasted sweet. Back in the states, the more common option was whiskey, a spirit made by companies that named brands after Confederate leaders or appealed to southern nationalism with labels such as Rebel Yell. It’s no wonder many African-Americans found that cognac left a better taste in their mouths. In the postwar period, the American market became even more important to cognac producers. That’s when scotch entered French markets and muscled aside cognac, according to Patrice Pinet, Courvoisier’s master blender. “Today, France drinks as much scotch as the amount of cognac it produces,” he said. To make up for that loss, marketing to an American demographic with a taste for cognac was a no-brainer, and the first spirit ads in both Ebony and Jet magazines, published in the early 1950s, were launched by Hennessy. Since then, the four main cognac houses—Courvoisier, Hennessy, Martell, and Rémy Martin—have all studied the U.S. market scrupulously and tailored their products appropriately. 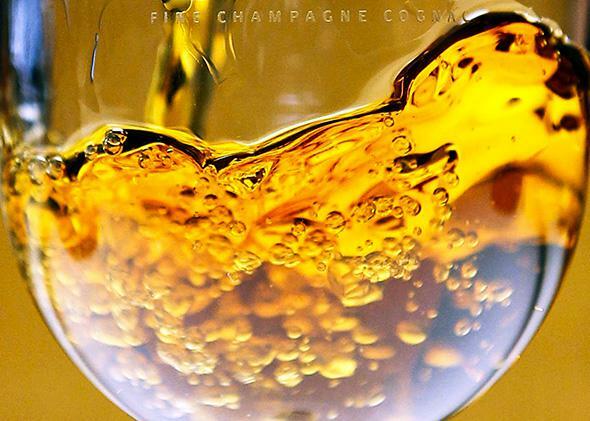 For instance, when Courvoisier discovered that American women were buying cognac and Moscato wine separately in liquor stores and then mixing them, it helped them skip a step by creating Gold, a brand that premixed the two. But this type of ostentation, tiresome as it often is, can also convey an appealing swagger. When Jay Z drank D’USSÉ Cognac straight from a trophy he took home from this year’s Grammy awards, it was a performance by an artist playing with the palette of mashups and appropriations his genre affords him. Beneath the surface of stereotypes comprising cognac’s public face—the snooty Frenchman, the blinged out rapper—runs a more sophisticated undercurrent. Cognac producers get this and tend toward a “live and let live” approach to how their spirit is used. Whether you drink it neat, with ice, in a cocktail, or dumped into a Grammy trophy, they’re quick to condone your approach. For a product with a split personality, that’s probably a good strategy. It’s also a lesson they’ve learned from champagne producers, whose famously snooty opinions about how their product should be stored, served, and consumed are a turn-off. In 2006, Frédéric Rouzard, president of Champagne Louis Roederer, maker of Cristal, famously miffed the hip-hop stars that had been promoting the brand for free by snubbing their patronage. Jay Z and others called for a boycott. Cognac producers, on the other hand, have embraced the outside world their sales rely on. Rémy Martin sells its growing number of Chinese customers cognac in an eight-sided bottle, which is a lucky number in the culture. Louis Royer makes kosher cognac exclusively for the New York market. This fall, in the town of Cognac, Hennessy is sponsoring an exhibit by the photographer Jonathan Mannion, whose portraits of hip-hop stars best capture in single, clean shots the vibes of a uniquely American genre that has driven their sales and arguably become global pop culture’s lingua franca. And Martell has helped sponsor an annual American Blues festival that has run yearly in the town of Cognac for the past two decades, attracting close to 30,000 (mostly European) visitors each year. One hallway of Martell’s headquarters even features an exhibit by the American artist Sharon McConnell featuring the plaster facemasks of obscure American blues musicians all but forgotten in their own country. It’s a fitting tribute to the fact that, labeling regulations aside, cognac has never been strictly French.